December 2016 Update - FedUp! In the final days of 2016, the federal government took an important step toward controlling the opioid addiction epidemic. A bill signed into law on December 13th called the 21st Century Cures Act includes $1 billion in grants to states to expand access to opioid addiction treatment. FED UP fought long and hard for this funding. In recognition of our efforts, Judy Rummler (FED UP’s chairperson) was invited to the signing ceremony at the White House. While pleased with the desperately needed funding, we have concerns that the 21st Century Cures Act may weaken an already too weak FDA. The law will make it easier for pharmaceutical companies to get new drugs (including opioids) on the market before they are proven safe and effective. This aspect of the bill puts the interests of pharmaceutical companies ahead of public health and it shows that Big Pharma continues to wield enormous influence in Washington. As you know, the opioid crisis is still getting worse. 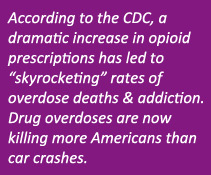 Opioid overdose deaths in 2015 exceeded the record high-level set in 2014. Deaths from prescription opioids, heroin and fentanyl are all still increasing. We have lots of hard work ahead of us. We will continue to focus on getting the federal government to do its part to bring the epidemic to an end. We remain hopeful the new President-elect will keep his promise to take on the pharmaceutical companies and expand access to opioid addiction treatment. FED UP will do everything in its power to make sure this happens. Your yearend gift to FED UP! would be greatly appreciated. It would help us continue to do our important work. Thank you for your continued support! This entry was posted in Advocacy Updates on December 1, 2016 by FedUp Rally.